In 2004, a magnitude 9.2 earthquake struck the northern Sumatra region and triggered a tsunami that inundated the Indian Ocean coast. The disaster was an important reminder to earth scientists that we must better understand the processes at work in subduction zones so that we can help mitigate future disasters. The earthquake was extremely powerful and surprising to geologists in that it was able to break through the plate boundary to relatively shallow depths (5-7 km) below the seafloor. 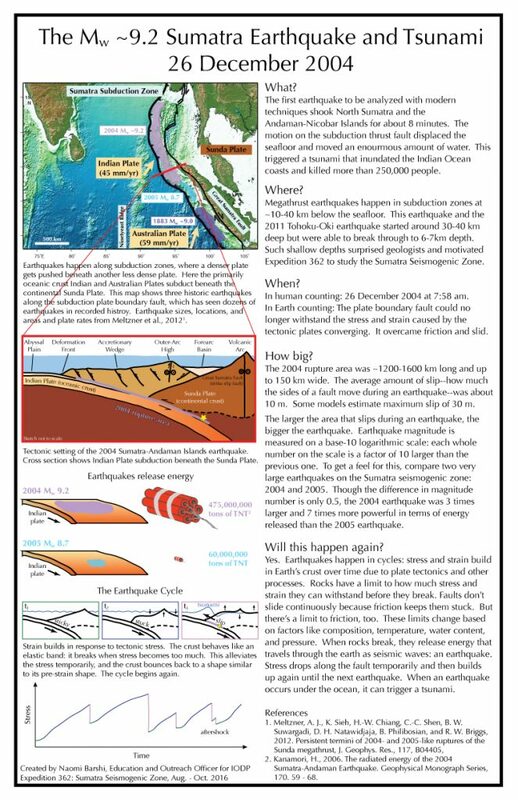 This poster explains some of the details about the events of 26 December 2004, which spurred the scientists on board Expedition 362 to drill into the seafloor and study the rocks and sediments that host major earthquakes once they reach the subduction plate boundary. For further reading, check out our pages about earthquakes and subduction zones, two of the main topics under study by Expedition 362: Sumatra Seismogenic Zone. This poster is printable on 11×17 in paper.